If you are traveling to Chile, you will likely be in Santiago, the capital city. While Santiago has a lot to offer, including great museums, you won’t want to spend all your time in the big city. Day trips from Santiago offer a way to escape the smog of the city and explore more of what Chile has to offer. One of the most popular day trips from Santiago (even for locals) is to head west to the Pacific coast. 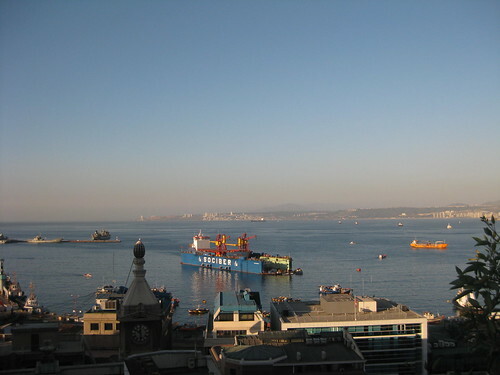 Almost due west of Santiago are the beautiful coastal towns of Viña del Mar and Valparaíso. These cities remind me of Seattle or San Francisco in the United States. They have houses and buildings built up the hillsides that rise up from the coast. Enjoy the architecture and multicolored houses that line the steep streets. The Ascensor Concepción is one of the city’s oldest funiculars. Go for a bumpy ride up a steep hillside while being treated to amazing views of the ships and coastline. I tried my first conger eel at a seafood restaurant in Valparaíso. Look for congrio frito on the menu and taste something new! Try and sneak a peak at the Chilean President’s weekend and summer palace, called Cerro Castillo that sits on the hill above the famous flower clock in Viña del Mar. The towering Andes mountains offer many outdoor activities that make for another one of my favorite day trips from Santiago. At the southeast corner of Santiago near Puente Alto is the entrance to the Cajon del Maipo. This canyon leads to adventures in hiking, waterfalls, hot springs, and beautiful mountains views. There are several small towns along the winding road through the canyon where you can resupply and have a meal. Here’s a tourist map of the canyon to give you some ideas. The city of Buin is just south of Santiago. It is surrounded by vineyards and orchards which produce some of the delicious fruit that Chile exports around the world. The Buin Zoo is just off of the main highway as you get close to Buin. The zoo features the typical animals from around the world but also offers an impressive collection of native Chilean animals. Head east of Buin and through Alto Jahuel to discover the Viña Santa Rita, a historic vineyard whose famous 120 line of wines was named after the 120 soldiers that liberator Bernardo O’Higgins hid there during the Chile’s fight for independence. What are some of your favorite day trips from Santiago? Let us know in the comments. Don’t miss La Sebastiana, Pablo Neruda’s house in Valparaiso. We took a self-guided tour of it in English in 2010, and we stayed at a great little hostel named Casa Limon Verde. Loved all the great graffiti and mosaic art in Valpo (the hostel had a bathtub covered in bottle caps!). Isn’t the flower clock in Viña, not Valpo? Thanks Pepe for the day trip ideas, perfect for our upcoming return visit in November! @Anne – thanks for sharing about La Sebastiana. And, you’re right, the flower clock is in Viña, I’ve corrected that in the article. Pepe, every time we are in Valparaiso, my husband has to visit the Naval and Maritime Museum. We’ll be visiting again in October. @Margaret – The Naval and Maritime Museum is a great place to visit. They have a beautiful stain glass window of Bernardo O’Higgins. Hi Pepe, i’m doing an assignment on a virtual world trip and one of my countries is Chile. Can you recommend some tours or sights in Chile along with Hotels close by? What’s the best way to get from the airport in Santiago to Viña del Mar? Hi Ralph- There is regular bus service between the airport and Viña.